The concept of Fork Truck Free (FTF) is not mentioned in the graphic above, yet it is addressed in each element. Let’s look more closely. Integrated supply chain management utilizing FTF initiatives are indeed revolutionizing the way products are designed, produced, and delivered while maximizing efficiencies and savings with a connected supply chain. Steps walked throughout a plant or repetitive fork truck runs back and forth are eliminated with mother-daughter carts. Mother-daughter carts are an industrial cart system consisting of one large mother cart and two or more, smaller daughter carts. The daughter carts are designed to fit within the mother cart’s framework. Once inside, the daughter carts are locked into the mother cart. The mother cart and daughter carts are then able to be tugged as one. Daughter carts are often different types of carts. One mother cart can be designed to carry a static cart as a daughter cart and a rotation cart as a daughter cart. The Mother Daughter Cart System is a very flexible, effective cart system. It facilitates an integrated supply chain by bringing products to the line as needed, increasing efficiencies. Prescriptive analytics are also part of an FTF initiative. By maximizing outcomes based on predictive analytics ensures optimal uptime and sustained performance. Carts are delivering a high-level material flow, bringing the right product to the line at the correct time. 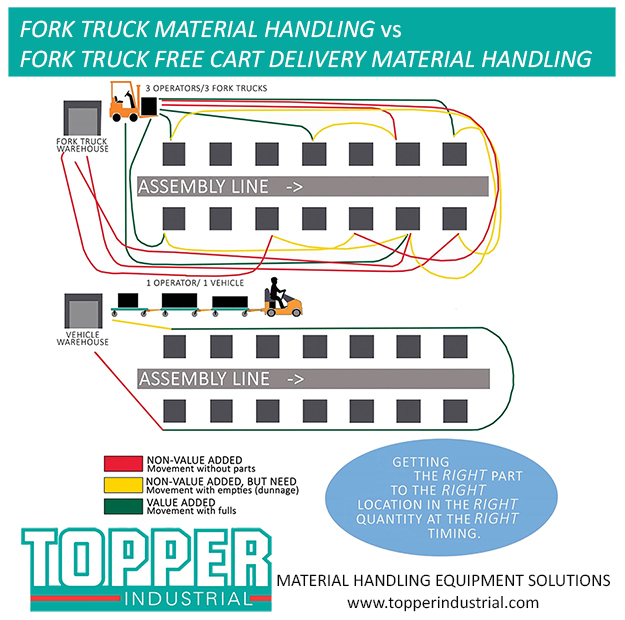 Real-time visibility allows carts to be monitored and reduce (even eliminate) fork truck utilization. Insightful decision-making becomes possible in the FTF space because all raw materials, finished goods, are delivered to a manufacturing cell or shipping dock precisely as needed. Zero wait-time is accomplished which eliminates downtime, improves labor efficiency, and ensures maximum productivity. FTF initiatives are an extension of Industry 4.0. Because Industry 4.0 is an extension of both engineer and IT, the ability to properly sequence production becomes an automated exercise. Industry 4.0 represents the way in which FTF initiatives capture the convergence of the digital and physical worlds—including information technology and operations technology. This transformation of the supply chain increasingly shifts from linear, sequential supply chain operations to an interconnected, open system of supply operations allowing manufacturers to fully realize the digital supply network. This is not a panacea, however when starting with the FTF initiatives, manufacturers are better prepared to unlock several capabilities including horizontal integration through the myriad operational systems that power the organization; vertical integration through connected manufacturing systems; and end-to-end, holistic integration through the entire value chain. A new manufacturing line can produce one product and up to 25 variants, with a 10 percent increase in productivity and a 30 percent decrease in inventory by using Industry 4.0 technologies. 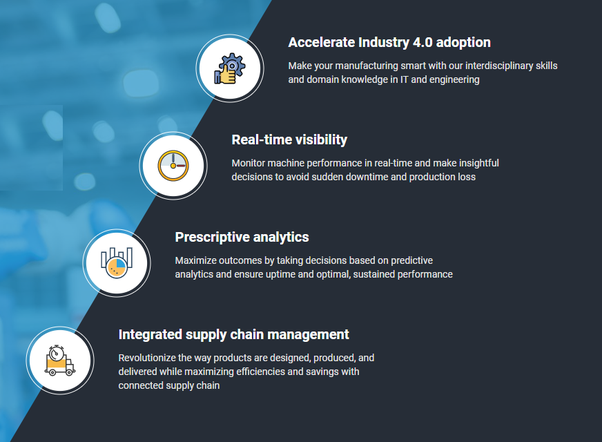 Industrial Internet of Things (IIoT) devices need to create the Industry 4.0 manufacturing environment and it all starts with connecting industrial carts. Topper Industrial will be at ProMat in Chicago Booth # S4812 from April 8 – 11.